There are some situations when drive go busy when reading ID or reading sectors. At such cases you can fix the problem by adjusting the automatic HDD initialization template. If you want just to fix BSY problem – don’t forget to uncheck Head Map correction. 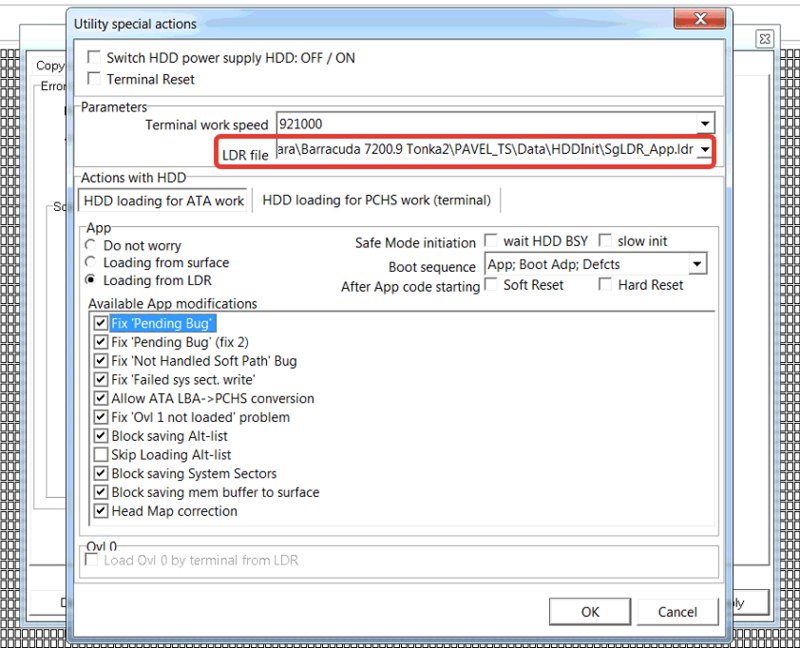 Uility can automatically read App code from HDD service area if ‘Loading from surface’ option is selected and App code at surface isn’t damaged. “Wait HDD BSY” and “Slow init” options are necessary when in cases where the standart procedure for switching to Safe Mode doesn’t initialize the SATA kernel of the drive completely. It looks like as follows: terminal messages show that the HDD had been initialized completely and went to the cycle of ATA command processing, however all bites of status and error SATA registers are on or off. Fix ‘Pending bug’ and ‘Pending bug (fix2)’ – the fixes allow bypassing of the so-called Pending Bug (a situation when a HDD devotes 99% of processor time to internal self-scanning process), making the processing of ATA commands much slower. Both fixes disable the so-called offline scan of disk surface using different methods. They are separated to extend the applicability range of the fix algorithm. Fix ‘Not Handled Soft Path’ – the fix helps to bypass HDD freezing which is encountered when the SMART subsystem is active and causing the terminal message “Not handled software path”. When the fix is used, the message still may appear, but the situation doesn’t cause HDD to freeze. Fix ‘Failed sys sect. write’ – the message appears when the SMART subsytem fails to update its logs because of writing problem. The fix disables the writing procedure, thus extending the HDD life in addition to acceleration interactions with it, as it blocks recording to the service area for SMART routines. 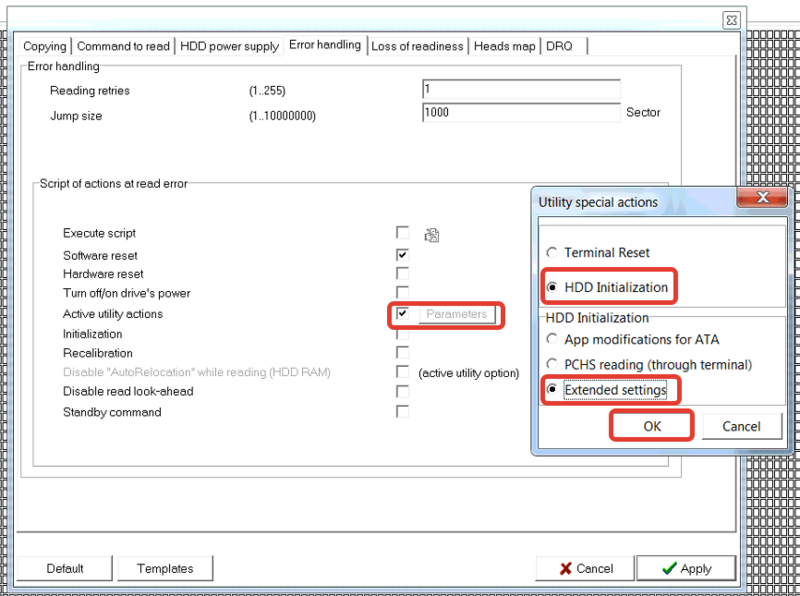 Enable LBA->PCHS conversion by ATA – modification of the drive that allow quick binding of the heads map via ATA mode. Block saving Alt-list – the modification blocks recording of an updated Alt-list to surface, which occurs when the Autoreassign mechanisms starts working as the HDD defects unreadible areas. Apart from accelerating work with the HDD, the fix extends HDD life because it prevents SA recording by Autoreassign. Skip loading Alt-list – this fix doesn’t initialize the area of list storage in RAM, thus causing garbage to collect here. It can be useful when drive has writing problems, cause in this case some FW versions can enter an endless cycle of recording attempts. Automatic use of it without real need isn’t recommended. Block saving System Sectors – this fix disables updating of the System Sectors data. It speed up the HDD and extends its life, cause fix disable recording to SA adaptive’s area. Block saving mem buffer to surface – disables the procedure of saving service data used by some of the SMART routines (e.g. reset) and routines which change FW settings. This fix speed up the HDD and extends its life, cause fix disable recording to SA adaptive’s area. and select LDR which you read during first initialization. Good luck on your data recovery business! Useful Info. Thanks Ace Lab Team.